With all the passion that can move anyone, Maceda Surf Camp is inviting you to experience the life of a surfer. Join a fully guided adventure, run away from city crowds, and explore remote beaches. Grab this once-in-a-lifetime opportunity to enjoy this adventure time and the awesome waves of the Portuguese sea. Surfing is one of the most famous water sports in the world. At this surf camp, surf lessons focus on five key areas so you can surf with confidence and style. 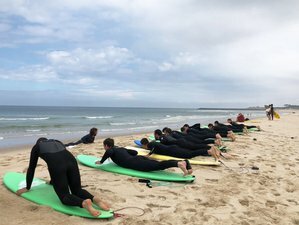 With years of experience, the school has developed superior instructional techniques to assist all levels of surfers from beginners to advanced. The five key areas are quality, accredited, fun, professional, and experience. For three days, you will have two surf lessons per day. The package includes a Porto city tour and a regional tour. He has been a surfer since he was 13 years old and an instructor for the last five years. He has a degree in Physical Education and Sports. He's got plenty of teaching experience in holiday camps and at all levels of learning: beginner, intermediate, and advanced surfing. Daily breakfasts are included in the cost of the surf camp. The house has a kitchen fully equipped where it is possible for visitors to prepare the meals and a fridge to storage food. Get the chance to enjoy, relax, have fun, listen to music, ride a bike, read a book, socialize, play ball, play table games, and get all the rest that you want to have. From Francisco Sá Carneiro airport: Metro Line E (Campanhã) - Campanhã Train Station - Line Aveiro - ride to Carvalheira - Maceda. Take train from Porto city center São Bento or Campanhã Train Station - Line Aveiro - ride to Carvalheira - Maceda. When you arrive in the station call us to pick you up or you can walk here, it's only 5 minutes away. Start walking to opposite direction of the supermarket and turn left from the first intersection that says praia de Maceda, turn on the next left and the surf house is on the right side. Airport: Francisco de Sá Carneiro Airport Airport transfer available: Francisco de Sá Carneiro Airport (US$68 per person) Additional charges may apply. You can request this in the next step. In Maceda Surf Camp you will live incredible experiences! Explore the best spots to surf, feel the nature and relax!